Want To Become Perfect in the New Year? With the coming of the New Year, we are prone to start thinking we must have resolutions. And with resolutions come the temptation toward perfectionism: I must keep my resolutions 100% correct and start the year off right. I know what you’re thinking. But I’m not a perfectionist! Well, just in case you haven’t yet taken my perfectionist quiz, here it is. Keep track of how many of these statements you relate to. A statement doesn’t have to be in your life 100% of the time in order to apply to you. If you generally think that way, count it. OK? Here we go. 1. Most of the time I sense God is disappointed with me. 2. I spend lots of energy evaluating my performance. 4. I think I should have my act together by now. 5. My expectations tend to be unrealistic. 7. I often wonder why other people can’t get their act together. 8. I’m compelled to straighten out misunderstandings. 9. I won’t begin something if there’s a possibility I can’t do it well. How many did you relate to? If you scored three or more, you have perfectionist tendencies. Here’s some background about how God began to work on my perfectionism. This occurred around 35 years ago. “Just let me mop the floor, OK?” I snapped at my two-year-old daughter. Her shoulder length blonde hair shook back and forth. “No, mommy. Play Cannyland!” She sat with the game, Candyland, on the floor, the pieces spread out helter-skelter. And that was exactly the description of my life: out of control. Between Darcy’s temper tantrums and my infant son’s nursing demands, I dreamed of having some part of my life back in control. At least a freshly mopped floor would show I’d done something useful. Somethingwould be perfect—if only for a few moments! Oh, Lord, why am I so dissatisfied with my life? Nothing is ever good enough to please me. Darcy constantly disobeys me and Larry is rarely home. I brushed away brimming tears. I want everything to be just right, is that so bad? I reflected on how angry I could become at Darcy, yelling at her and even hitting her. Plus, I was so discontented with Larry working two jobs and rarely home. If Darcy would just obey me and if Larry would help me with the kids, then I might cope better. When am I going to get my life together? Then slowly, God began opening my eyes to the causes of my anger. Of course, there were many, but one was particularly significant: He began helping me release my perfectionist tendencies. Someone has said, “A perfectionist is a person who takes great pains…and passes them on to others.” I finally realized I was passing the great pains of trying to make everything perfect onto others and myself. But how could I stop? That was my life many years ago. 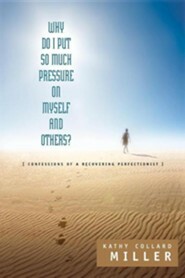 In my next several posts, I’ll continue with some ideas for dealing with perfectionism. 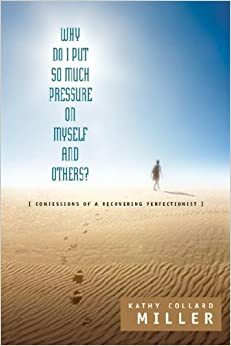 If you’d like more information about dealing with perfectionism, check out my book: Why Do I Put So Much Pressure On Myself and Others? at Amazon: http://amzn.to/1efy5BF OR CBD: http://bit.ly/Ji0HAR. I also have copies available. Before the end of the year, I’ll sell each copy for half price (including postage) for $8.00. Email me at Kathyspeak AT aol DOT com if you’re interested.